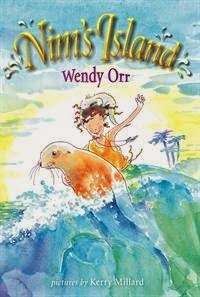 Nim's Island by Wendy Orr, illustrated by Kerry Millard. Nim Rusoe's parents are scientists and one random day Nim's mum goes to find out what its like inside a whale's mouth......does this sound odd? Aaaany way these crazy people called "The Troppo Tourists" come and they scare the whale. The whale goes crazy, dives under water, mum is never seen again. Sad story. Sniff. Sniff. 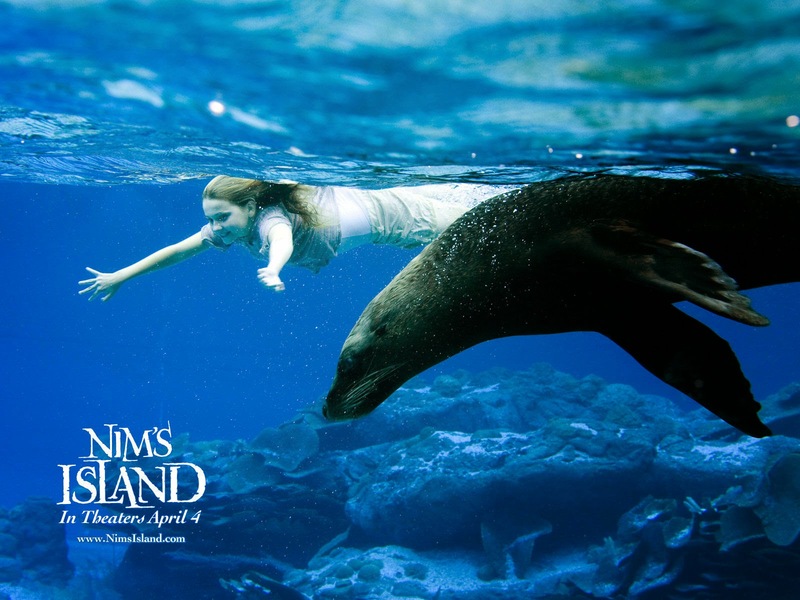 Nim has a few cool pets: Selkie the seal, Fred the iguana, Chica the turtle and Galileo the pelican. One day when Nim is around 11yrs old, Nim's plankton crazy father decides he is going to go on a three day trip to find new species of plankton and do some research on them. Nim is left alone. 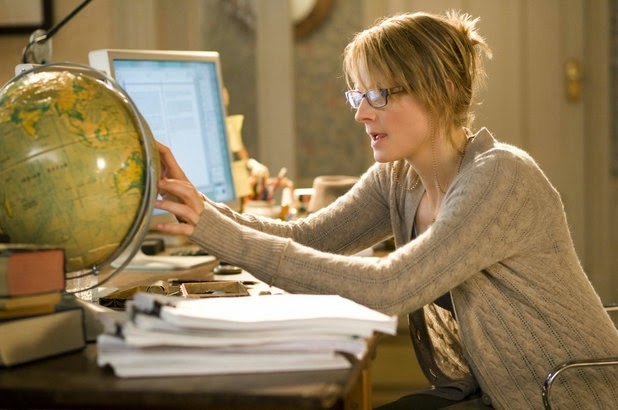 The next day Nim gets an e-mail from someone called Alex Rover who is doing some research for her next adventure book. Alex wanted to know if it was possible to make a raft out of coconuts. Nim makes a raft by putting a bunch of coconuts in a sack and tries it out with Selkie. Nim and Alex go on corresponding for a while before Nim actually realises 'Alex Rover' is the hero in her favorite adventure books. On the island is a volcano that they call 'Fire Mountain'. Nim climbs it to see if she can spot Jack because he has been gone for ages. The volcano starts rumbling and Nim rushes to get down. She trips and slides down the side of the mountain. there is a big gash in her knee. She limps home and e-mails Alex to ask for help. Alex tells her that she will come as soon as she could get a flight. In New York Alex is packing and booking flights. A couple of days later Nim notices a ship heading for the island.She soon realises that it is the 'Troppo Tourists' cruise ship. Obviously she's quite scared but keeps her head. Nim gets Fred to call all his iguana buddies and thay completly cover the beach and stick out their spikes as far as they can go. Selkie gets in the water and acts all yucky and mean. While Nim watches from a tree on the beach, a revolting smell wafts over the beach. The troppo tourists are disgusted and they leave quickly.Nim soon finds out that the smell was from a dead shark. Gross! Meanwhile Jack is busy collecting plankton. A storm is brewing, and after a while is in full blast. On the island Nim gathers her pets and goes to the emergency cave. Alex meanwhile has just bought a small row boat from....the Troppo Tourists! So the storm worsens but Alex manages to get close to the island. Then she somehoow gets this hole in her boat and it starts to sink. She tries to bale out the water but is not quick enough. (Sadly she is a hopeless swimmer). On the island, Nim saw Alex's boat and thought it was her dad's one. Along with Selkie and Chica, she goes out onto the beach and heads towards the boat. She soon realises it is Alex. So they both manage to get to shore okay and go to the hut for the night. Now Jack's boat has just sunk and he (obviously) is struggling to swim. Along comes this raft thing made of coconuts and an old sack.(remember). So he grabs it and it takes him to shore. On the island Nim and Alex see him and quickly run out to him. Then there's the whole reunion thing and Alex and Jack kind of like each other. And (of course) Alex comes and lives on the island and writes a book called "Nim's Island". P.S. If you managed to read up to here you have a lot of patience, this was a bit of a mammoth post! And a few photos from the movie....no one is happy without photos! Nim with Fred the iguana on her shoulder. Alex in her New York apartment. 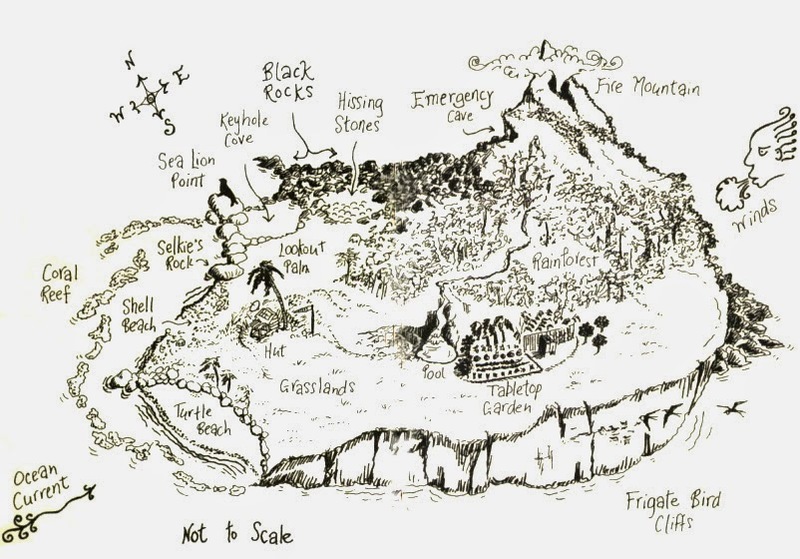 A map of Nim's Island.